The solemn liturgy for Ash Wednesday is celebrated, including the imposition of ashes, with the Epiphany Choir. Blessing of Palms in the Mullins Garden, followed by a palm-waving procession around the block led by a bagpiper. Holy Eucharist includes a dramatic presentation of the Saint Luke Passion by members of the church. Jesus commands us in the Gospel for the day to “love one another, as I have loved you”. The congregation (those who wish) and clergy participate in the ritual of footwashing, the holy eucharist is celebrated, the reserve sacrament is removed to the altar of repose in the chapel, and finally the chancel is stripped of all decoration in preparation for Good Friday. Prayer in the Chapel in the Garden of Repose. Beautiful choral and organ music for meditation on this solemn day. The Saint John Passion is sung by the choir and soloists, the Bidding Prayer is prayed, the crucifix is brought forward in procession for veneration, and communion is received from the reserved sacrament. • A new fire is started outside and the new Paschal Candle is blessed and lighted. All are led by the new Paschal Candle into the darkened church, carrying our own lighted candles, and the joyous Exsultet is chanted. • A number of Old Testament readings are proclaimed, reminding us of God’s mighty acts throughout history, each followed by a sung response. 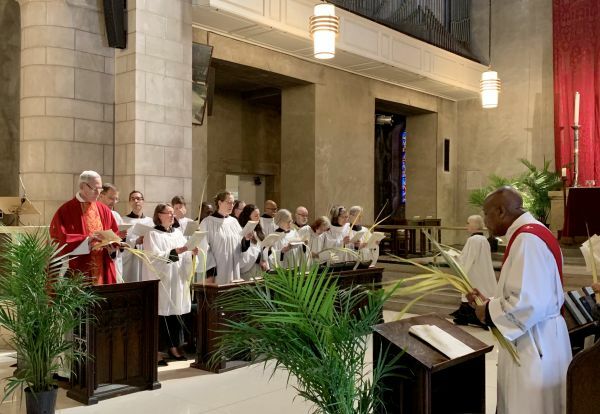 • We process to the baptismal font at the rear of the church, and celebrate holy baptism and the renewal our own baptismal promises while being sprinkled with water from the font. • The resurrection is proclaimed, the lights in the church are turned on, and we process to the front of the church, singing a joyous Easter hymn. The first eucharist of Easter is celebrated with choir, organ, trumpet and timpani adding to the festivity. • A festive reception follows at the back of the church with many tempting delights, breaking our Lenten fast. This joyous celebration of the Holy Eucharist includes music for choirs and congregation, organ, brass, and timpani. An Easter Egg Hunt is held for all children in attendance in the Mullins Garden after the postlude is concluded. This is the only service celebrated today – no 8:30am nor 5:00pm services.